We have had an El Niño year which has only just reached neutral or slightly negative conditions. Whether it will be followed by a La Niña will not be clear until the negative conditions persist for some 9 months. 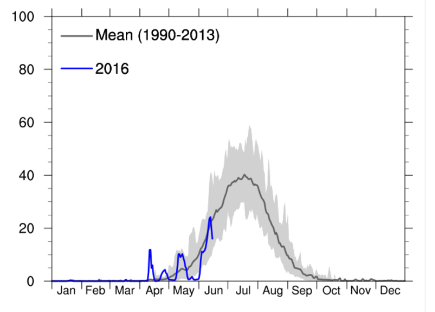 Recently we have had screaming headlines claiming that the Greenland ice melt in April was unprecedented and the region was experiencing its hottest year ever and catastrophe was nigh (here, here and here). Arctic amplification was to blame. The world was about to be swamped. But it was all just nonsense. All just the usual alarmist exaggerations. Some of it was just the usual editorial creativity and some was misconduct bordering on fraud. 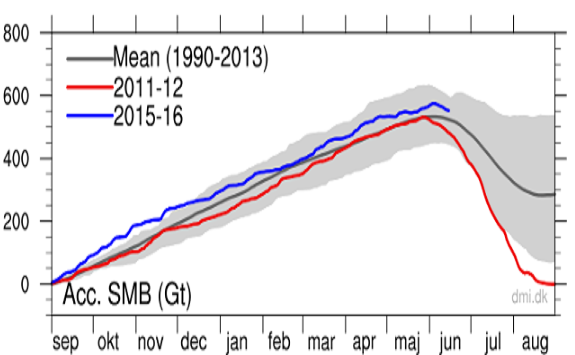 Since September 1st, the Greenland ice sheet has gained about 550 billion tonnes (Gt) of mass, which is higher than the long term mean by some 5 -10%. I give it about 5 years before the global warming pendulum swings back to an alarmist global freezing meme. 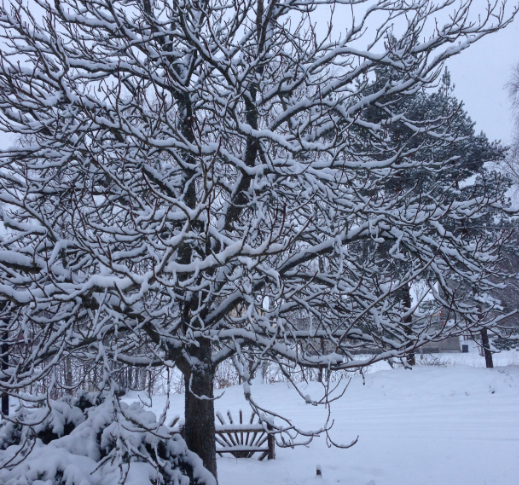 After a relatively mild December (snow didn’t arrive until the 27th), we have had a few days now at -20ºC (though it has been down to -44ºC in the North). We have had no blizzards but steady snowfall is building up the snow levels. El Nino is weakening and children have good prospects of healthy snow levels for the “sports week” vacations in February. 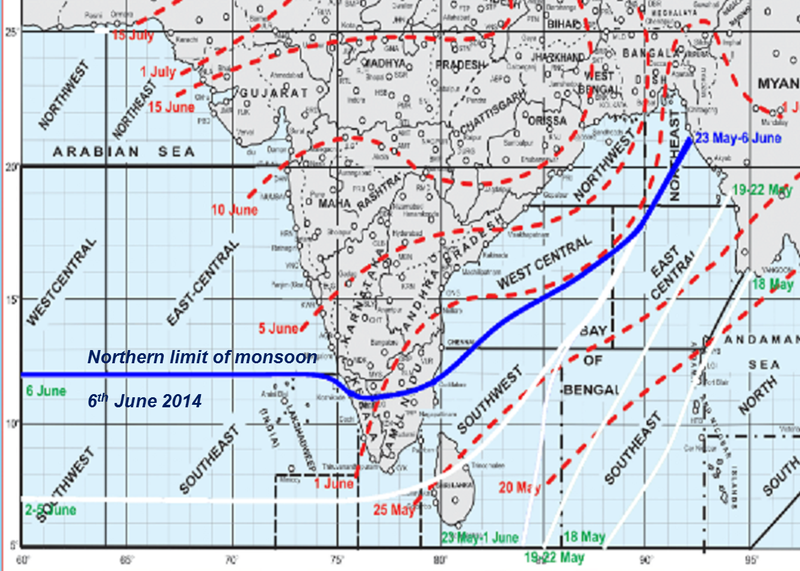 The long range forecast was revised a few weeks ago and there is a risk that this year’s monsoon may be somewhat deficient. But the onset has not been much delayed and the first week’s rainfall is slightly above “normal. The second LRF cast a shadow over the markets when it was announced. But the pessimism may have been overdone. Rainfall over the country as a whole for the 2015 southwest monsoon season (June to September) is likely to be deficient (<90% of LPA). Quantitatively, monsoon season rainfall for the country as a whole is likely to be 88% of the long period average with a model error of ±4%. Region wise, the season rainfall is likely to be 85% of LPA over North-West India, 90% of LPA over Central India, 92% of LPA over South Peninsula and 90% of LPA over North-East India all with a model error of ± 8 %. The monthly rainfall over the country as whole is likely to be 92% of its LPA during July and 90% of LPA during August both with a model error of ± 9 %. The monsoon onset was just a couple of days “late” compared to the forecast date (which is in itself always a warning sign). Furthermore, this year could be an El Nino (albeit weak El Nino) year which could depress rainfall levels. One week into the 13 week monsoon season, however, rainfall is running at 4% above the long term average. The northern and western ends of the front are progressing well but the central section is well behind its “normal” advance. In terms of rainfall distribution the north-east and the south which usually receive the highest rainfall by this time are running slightly ahead of normal. The central and north-west region receive low levels of rainfall in this period but the north-west is running 44% above normal while the central regions are deficient and running at -20%. The warnings about potential deficiency has led to the government planning measures for those farmers who are not “covered” by irrigation networks and are solely dependent upon rainfall. With one month to go for the “official” 4 month-long monsoon season, rainfall has been 18% deficient so far. 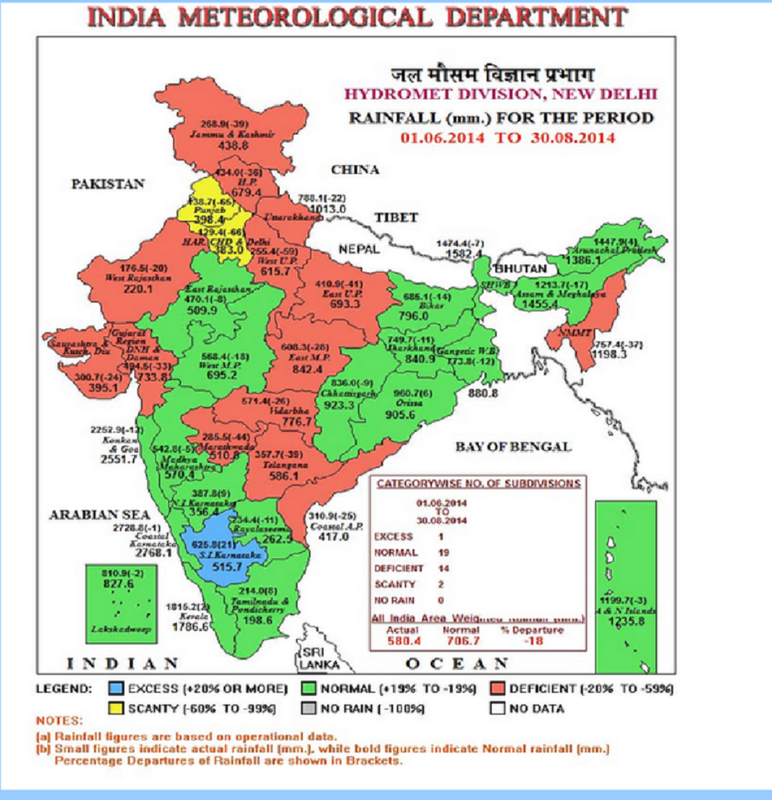 At the half-way mark most states were deficient in rainfall. However about half the states have now crept back to “normal” rainfall. With any El Nino only expected to be weak – if it even actually develops – a catastrophic monsoon can now be ruled out. Rainfall will be below normal but the last month of the monsoon holds some hope for further recovery. 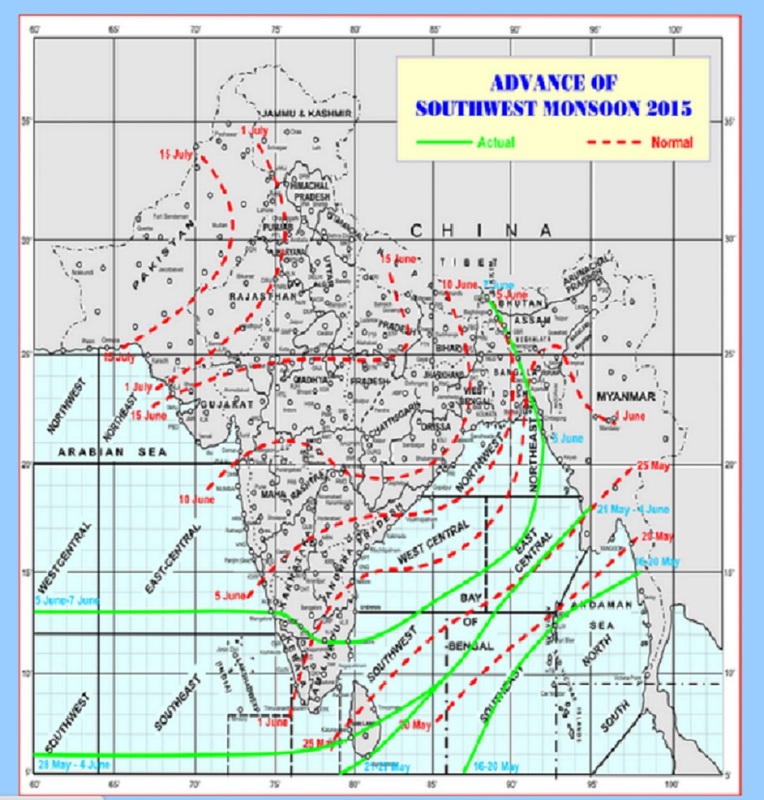 There is also some hope that the monsoon – which developed about 10 days late – may also be delayed in withdrawing giving some rainfall into the first two weeks of October. It will still be a “poor” monsoon but may not be labelled “bad” or “catastrophic”. There is still some risk that a poor monsoon will hold back the industrial recovery somewhat. The growth in the last quarter has been the highest for 2 years as sentiment has turned positive, and is not likely to be reversed by this “poor” monsoon. India’s economy grew by 5.7% in the three months to June, its fastest pace in two-and-a-half years, according to an official estimate. The economy was helped by strong growth in electricity, gas and water supply, and financial services, the Ministry of Statistics said. ….. Ever since the Narendra Modi government took charge, business sentiment has improved on the ground. Investors have started pumping in money again, capital markets have been roaring, consumer demand has revived & hiring has picked up. But this euphoria is primarily driven by sentiment and more steps would be required to sustain this optimism. The latest forecast from the Australian Bureau of Meteorology has now downgraded any El Niño event in 2014 to be – at worst – a normal or a weak El Niño. There is still a reasonable possibility that it will develop, but that itself means that there is now a significant probability that it may not even happen. The alarmist clamour of 3 months ago, enthusiastically disseminated around the globe was clearly somewhat exaggerated. Despite the tropical Pacific Ocean being primed for an El Niño during much of the first half of 2014, the atmosphere above has largely failed to respond, and hence the ocean and atmosphere have not reinforced each other. As a result, some cooling has now taken place in the central and eastern tropical Pacific Ocean, with most of the key NINO regions returning to neutral values. While the chance of an El Niño in 2014 has clearly eased, warmer-than-average waters persist in parts of the tropical Pacific, and the (slight) majority of climate models suggest El Niño remains likely for spring. Hence the establishment of El Niño before year’s end cannot be ruled out. If an El Niño were to occur, it is increasingly unlikely to be a strong event. Given the current observations and the climate model outlooks, the Bureau’s ENSO Tracker has shifted to El Niño WATCH status. Back on 6th May, the ABM wrote ” The tropical Pacific Ocean has warmed steadily in recent months, with large warm anomalies in the ocean sub-surface (5-day values up to +6 °C) and increasingly warm sea surface temperatures. Climate models surveyed by the Bureau suggest El Niño development is possible as early as July”. Climate models are not as robust as some would like us to believe. The alarmists such as Joe Romm went to town with dire predictions just 3 months ago and were predicting a “super” and a Monster” El Niño for 2014. Of course, dire predictions which never ever materialise are the stuff of alarmism. The clever alarmist is the one who makes unverifiable predictions which will never happen but which cannot be disproved. Joe Romm, 26th March: Is A Super El Niño Coming That Will Shatter Extreme Weather And Global Temperature Records? Signs are increasingly pointing to the formation of an El Niño in the next few months, possibly a very strong one. When combined with the long-term global warming trend, a strong El Niño would mean 2015 is very likely to become the hottest year on record by far. ……. John Upton, May 16th: A monster El Niño could be on its way, and it will likely have a complicated effect on the world’s breadbaskets. Something fierce is rising out of the Pacific Ocean, and its appetite for the world’s major carb crops could be even more ravenous than that of a monstrous mythical sea creature. …… A dinosaurian belch of warm water thousands of miles wide has appeared at the surface of the Pacific Ocean near the equator. The warming ocean conditions have spurred NOAA to project a two-thirds chance that an El Niño will form by summer’s end. It’s tipped to be of the monster variety—the extreme type that could become more common with global warming. El Niño events come regularly and we can expect that will continue. But in 2014 it will at worst be a “normal” or a weak El Niño. 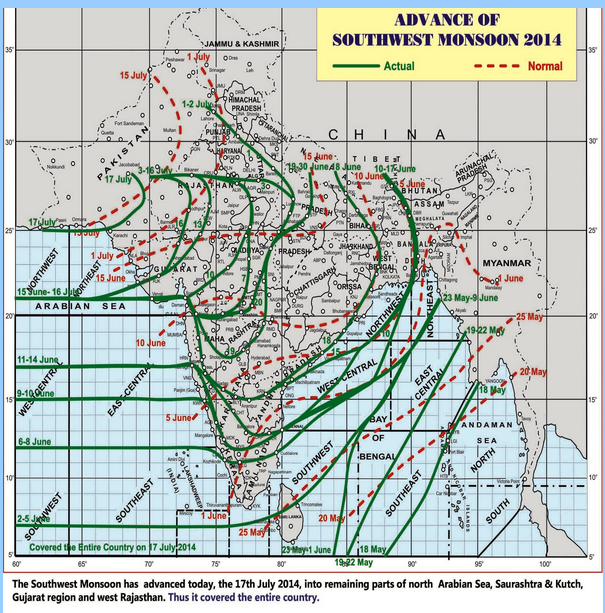 Its feared effects on the Indian monsoon have also been downgraded. The monsoon which is now half-way through its season has recovered somewhat. But the simple truth is that not a single one of the dire predictions that global warming alarmists are wont to make has come to pass. Yesterday the monsoon covered the entire country but while this is only 2 days later than the “long term average”, the progress of the monsoon across south and central India has been around a week or 10 days late. Until last week the rainfall was in deficit by over 40%, but heavy rains this week are beginning to eat into this deficit. In the meantime the possibility of a strong El Niño this year, which could have further depressed the monsoon rainfall, is receding. With 2½ months of the monsoon season left, there is now a reasonable – and improving – probability that the shortfall will end up at less than 10% of the long term average and that the hit to the Indian GDP will not be too severe. Climate alarmists (mainly the environmental mafia) have been hoping – and praying – for a strong El Niño, a disastrous monsoon, a strong blow to the agricultural sector and an increase in farmer suicides. They are increasingly likely to be disappointed. Fortunately the cost to consumers usually reduces and the good of society usually increases with the increasing disappointment of the loony green mafia. The best thing to have happened for Australia in years is probably the recent repeal of the Carbon tax which has – surprise, surprise – caused great disappointment to the loony green mafia. ET:The monsoon delivered this season’s heaviest showers on Tuesday, drenching southern and central India with 50 per cent more rainfall than normal, while international forecasters said the rain-disrupting El Nino phenomenon would be weaker than feared. The northern and western parts of the country remained relatively dry, but for the country as a whole, Tuesday’s rainfall was 10 per cent above normal, reducing the season’s rain deficit to 40 per cent. The deficit is still abnormally high, but two days of heavy rainfall is expected to speed up crop planting, which was half of last year’s mid-July level. The weather office has forecast good rainfall in many parts of the country in the days ahead. Further, the latest forecast of Australia’s weather department could bring some relief to policy-makers as it has suggested that the El Nino weather phenomenon that curtails June-September rains is unlikely to be intense this year. Warming of the tropical Pacific Ocean over the past several months primed the climate system for an El Niño in 2014. However, a general lack of atmospheric response over the last month has resulted in some cooling of the tropical Pacific Ocean. While the majority of climate models suggest El Niño remains likely for the spring of 2014, most have eased their predicted strength. If an El Niño were to occur, it is increasingly unlikely to be a strong event. Changes are also occurring in the Indian Ocean. The Indian Ocean Dipole (IOD) index has been below −0.4 °C (the negative IOD threshold) since mid-June, but it would need to remain negative into August to be considered as an event. Negative values are rare when the central Pacific is warmer than average. Model outlooks suggest the IOD is likely to return to neutral by spring. Conditions in the Indian Ocean may have contributed to the above-average rainfall experienced in southeast Australia during June. Interesting paper but the headlines it generates are even more interesting. Our results suggest that global annual evapotranspiration increased on average by 7.1 ± 1.0 millimetres per year per decade from 1982 to 1997. After that, coincident with the last major El Niño event in 1998, the global evapotranspiration increase seems to have ceased until 2008. This change was driven primarily by moisture limitation in the Southern Hemisphere, particularly Africa and Australia. That evapotranspiration should decrease if the moisture is not there in the first place seems perfectly reasonable. That we will have to use technology to get ground water levels back up as water usage increases is also fairly obvious. It occurs to me that global temperatures have been stable if not declining over the last decade which also fits the period when they measured the stable evapotranspiration. I note – in passing – that evaporation from ocean surfaces is some 7 times greater than the evaporation from land surfaces while precipitation over the oceans is about 4 times greater than that over land. But the NS headline is a little bizarre.